You will be given a reference e-book to read which has 250 pages And the test will be based on that e-book , you can take final test within 1 year of purchase. Brain training refers to a simple yet powerful way of enhancing one’s core ability to learn easier, better and faster. The human brain is capable of effectively processing information with the help of a complex network consisting of nerve cells referred to as neurons. During the learning process, groups of neurons tend to physically work together with an aim of accomplishing essential tasks associated to thinking and learning. According to research, additional neurons are going to be drawn in the learning process whenever a new or an unfamiliar task is being carried out or when the specific demand for learning is intensified. If the tasks are already mastered, then the additional neurons will be released in order for them to start performing other functions. The released neurons are said to be more efficient when it comes to speedily processing information, thereby making it easier for your brain to learn faster. When it comes to boosting the ability of the neurons in your brain, you should keep in mind that an effective cognitive or brain training is extremely useful. This type of training is primarily composed of various exercises designed to assist you in improving the proper functioning of your brain especially in vital areas like auditory and visual processing, reading, listening, thinking before acting and sustaining focus and attention. This type of training utilizes a lot of effective tools that can be used in improving the proper functioning of a human brain including neurofeedback, person to person motor cognition tasks, logic and mind games and computer tasks. If you want to master the procedures involved in carrying out the brain training process, then be aware that Brainmeasures which has received excellent reviews from all the participants of its online certification courses is now offering a brain training certification course designed to improve your skills and knowledge in the field of brain training. This brain training course is developed by real experts in the field so you have an assurance that you will be able to master even the most complex areas and subject matters associated to it. With the help of this brain training certification course, you will be able to master the definition of brain training, its major functions and the methods that are now used in making the most out of the process. It allows you to master how your brain and your neurons work so you will have an easier time training it to perform better. 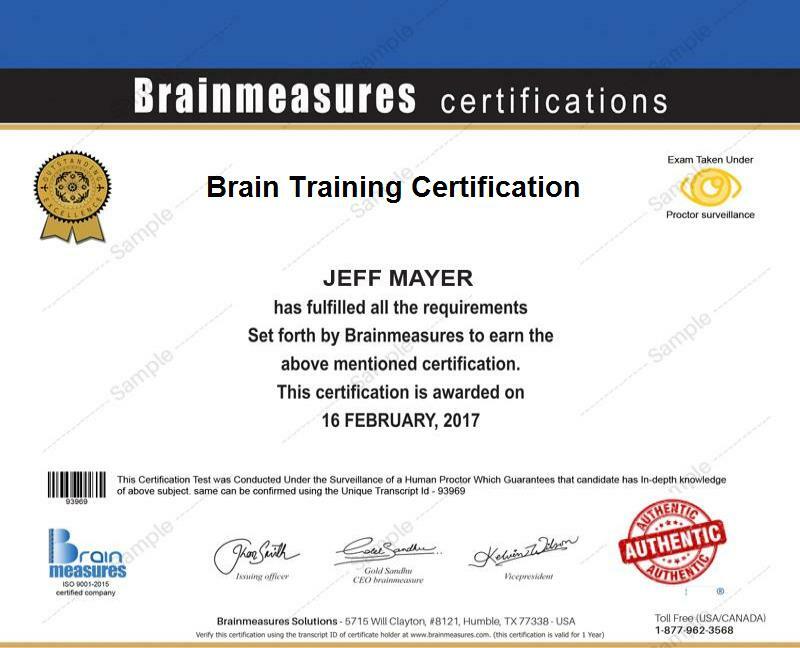 Receiving your brain training certificate from Brainmeasures is proven to be really rewarding considering its ability to help improve your confidence in this field since you know that your knowledge about the process is already enough to compete with other experts. How to foster a happier and a healthier mind? Anyone who wishes to improve their skills and knowledge in the field of brain training can take part in the brain training certification program offered by Brainmeasures. This certification course is more beneficial for all professionals who have numerous daily tasks and responsibilities and want to further improve the ability of their brain to focus and perform even better. It is also beneficial for individuals and professionals, regardless of age, who wish to use brain training when it comes to sharpening their memory, maintaining focus and attention, reaching peak performance and enhancing creativity. When it comes to improving your financial stability, bear in mind that completing a brain training certification course can help you out. As a brain training certification holder, you can expect to start working as a certified brain trainer which allows you to charge your clients either on an hourly or a fixed basis. If you work per hour, then you can charge your employees from $16 to $40 per hour depending on the extensiveness of your work. You can also charge them on a fixed basis which allows you to earn as much as $80,000 per year.